Pam’s friend Tracie is all of a tizzy – she’s terrified of her mum walking out on the family. The obvious question is, why would she do that to them? It’s a serious worry: her mum is increasingly fed up with her home life and actively threatens to leave them. Of course it’s causing Tracie no end of worries on a daily basis but it also means there is no way she wants to come on the class trip to France. Pam’s cheerful mother thinks it’ll never come to that point, but when Tracie gets home after school one day and finds that her mother has packed a bag and got on the 3 o’clock bus it seems like quite a different matter! Kathy is trying hard to prove herself as a runner to her classmates and her teachers, but bad luck and the bullying nature of the horrible Sandra Simkins mean everything is against her. Even the obstacle race is a shameful experience for her – so bad that she vows to run away. At least her speed in running will help here there! 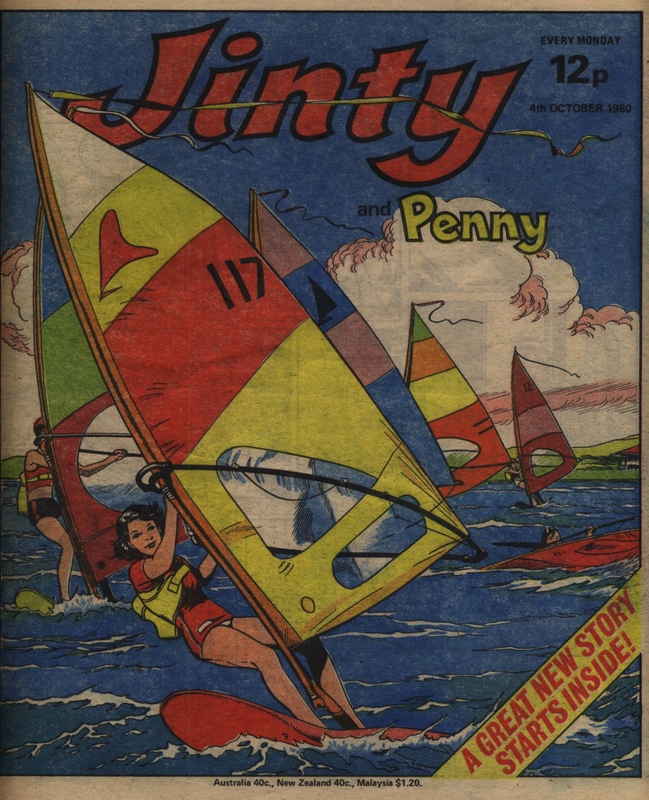 The Gypsy Rose story is clearly drawn specially for Jinty as it’s by Terry Aspin throughout in a matching style. 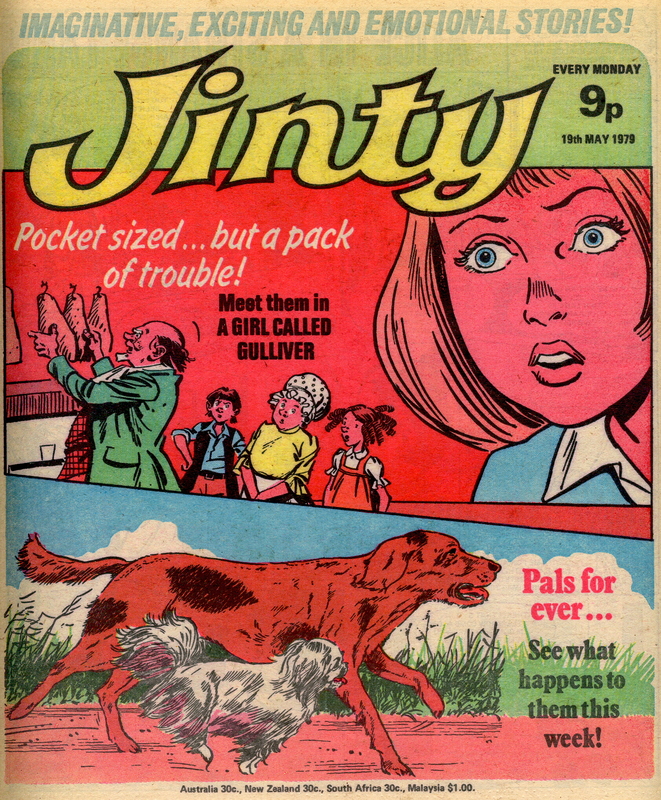 Kay’s little sister Jenny has an imaginary friend called Mary who rings her on the toy phone – but one night the toy phone really does ring and Mary pleads for help because the hospital she is in is burning down! It turns out to be a hospital for toys, very fittingly. Gypsy Rose introduces the story and rounds it off at the end, rather than being one of the characters in the story itself as she sometimes is – but her appearance outside the burned toy factory in the last two panels makes it clear that she inhabits the same world as the stories she tells, that is, they are really real as far as she is concerned. In the first episode of “Sue’s Daily Dozen” Sue Baker is feeling left-out as the only newcomer to the village. In the house that her dad is busy doing up, she finds a mysterious set of items that help her to integrate into village life – an old cooking pot, a ‘Daily Dozen’ book, and a spoon. Suspiciously witchy-sounding? But the first recipe, of some little cakes, turn out smashingly – but they do seem to be causing people who eat them to act a little… oddly. Jemma West learns yoga from her serendipitous guest but when the rain comes down again she still can’t control herself enough, and she loses a big chance. 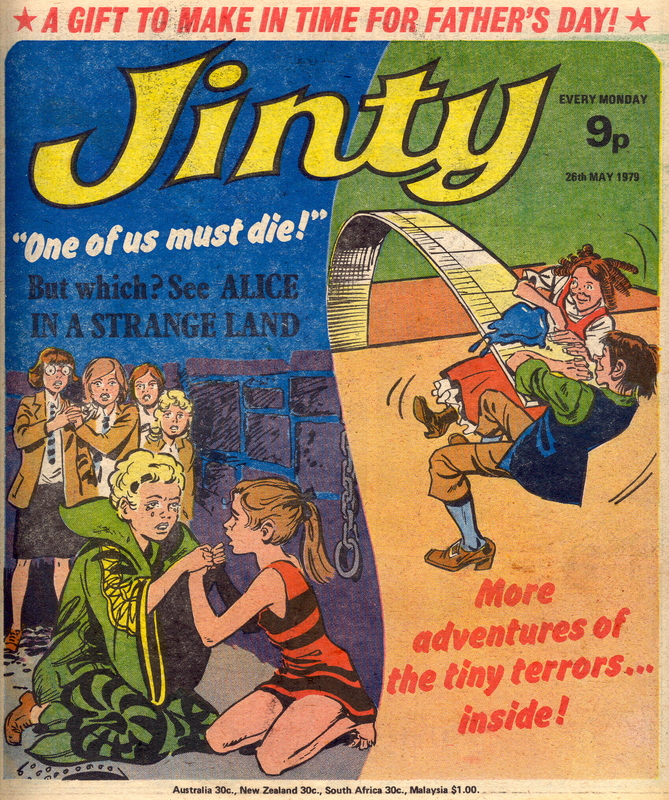 This is a time when Jinty seems to be finishing some particularly good stories – “Alice In a Strange Land”, “Children of Edenford”. 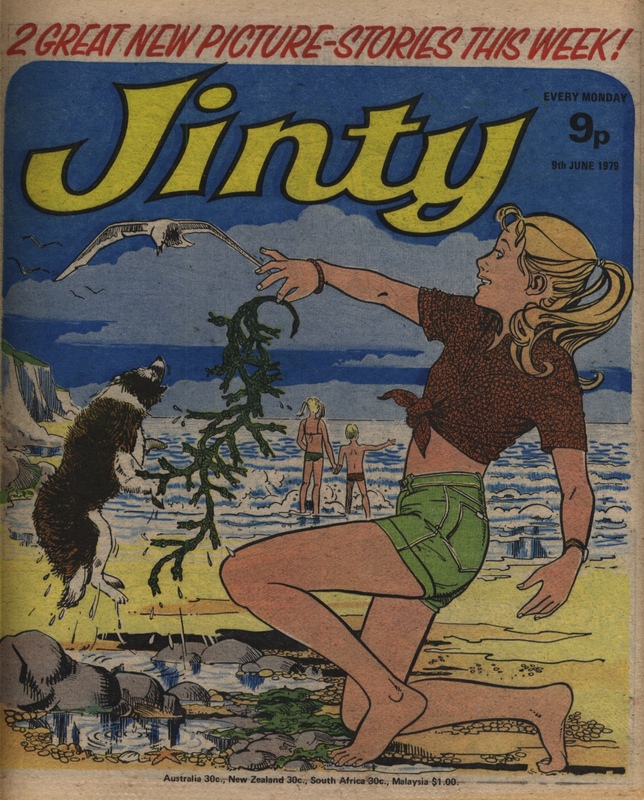 This issue sees the start of tear-jerker “Nothing to Sing About” – another heart-tugger created by the joint talents of Alison Christie and Phil Townsend – and of the amusing but fairly light-weight “Pandora’s Box”. Next week sees the first episodes of “Casey, Come Back!” – another tear-jerker, drawn by the unknown artist who drew “Merry at Misery House” – and “The Disappearing Dolphin”, a mystery story beautifully drawn by Trini Tinturé. All are good, but none quite match those immediate predecessors. 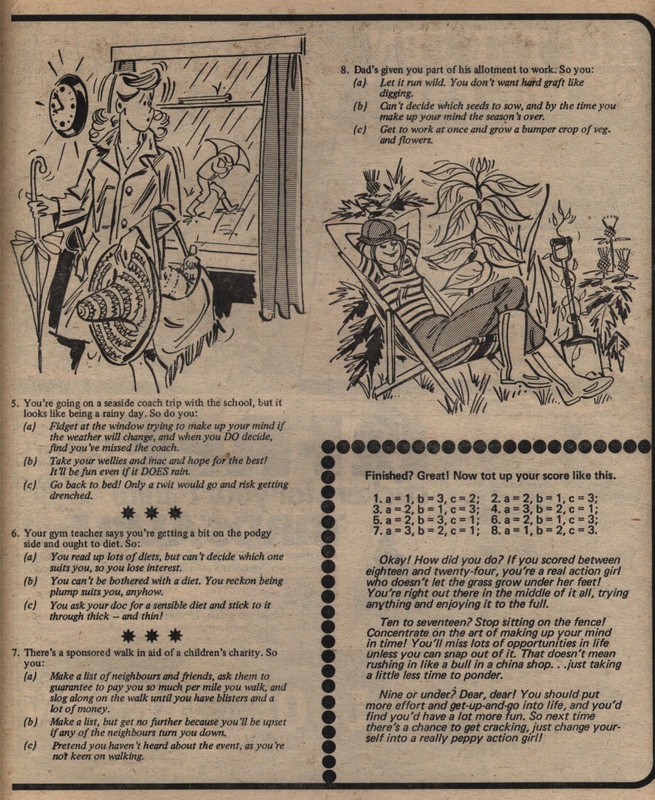 “Alice” ends with a four-page episode that takes Alice out from the crumbling rocks threatening to crush her, to a reunion with her friends and a reconciliation with her cousin Karen. “I’m proud to be your cousin, Alice! I hope you can forgive how badly I’ve treated you in the past and let me be your friend?” Karen’s parents still need to understand the changed relationship but eventually all is resolved. The tag line at the end tells us that “Alice has deserved her happy ending. 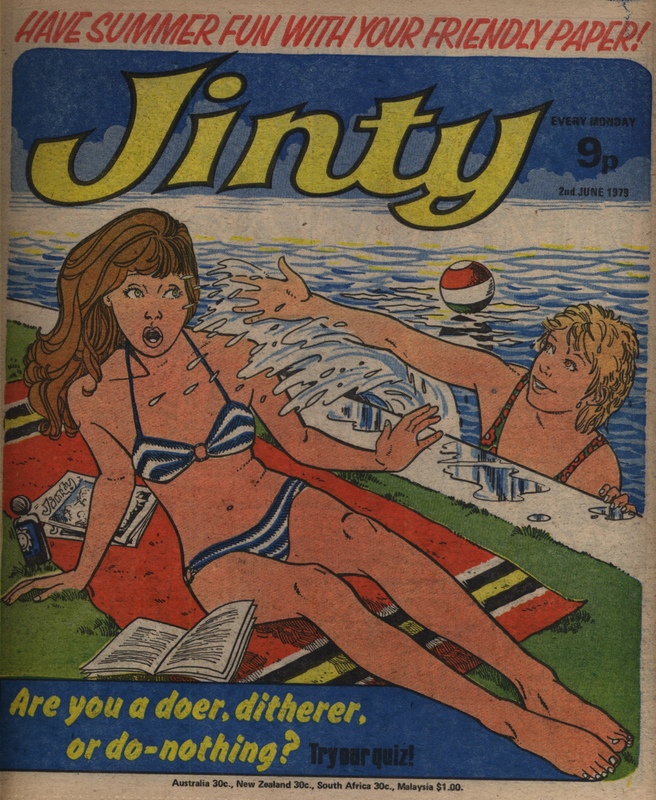 Next week, meet ‘The Disappearing Dolphin’!” In fact, the subsequent cover mostly features that story but the lead spot at the front of the comic is taken by “Casey, Come Back!”. “The Forbidden Garden” is picking up the pace: Laika is told that someone has reported her as being of superior intellect, which means she is saved from the Industrial Zone where the rest of her family will just rot away their lives. Her old friends can’t afford to stay friendly with her, because if Laika makes any complaint about them, they will be severely fined, even imprisoned! The only bright side is that she can get back to her garden and tend to her plants – but even they are a source of fear, because surely they are growing much too fast? There must be something strange about them! “Nothing to Sing About” starts off with 12 year old Linette Davis following in the footsteps of her beloved, popular singer father. By the end of the first three-page episode, her father is dead, and Linette is cursing the fans who she blames for killing him, by crowding round him too much! It is the last episode of “Daughter of Dreams”. In this four-pager, Sally realises she can be brave after all, when she has to act without thinking – and her imaginary friend Pauline has a hand in making everything come out right, too. We are promised another Pauline Starr story later, so it looks like this was intended to be a long-running character feature. In the end there were only two stories featuring this duo. Laura and her mum have to go and visit the slums that Laura’s friend Josie used to live in – Laura thinks this will change her mum’s mind now that she has seen how badly folks need re-housing, but not a bit of it, of course. In fact Laura’s mum purposefully gets Josie’s dog Riley lost, leading him into danger with the dog catchers. Finally, it is the first episode of “Pandora’s Box”. Pandora is stubborn and conceited, but in for a shock – it’s bad enough her aunt suddenly claiming to be be a witch and telling her that she has to follow the family tradition of learning the ‘wisdom of witchcraft’ but her aunt is also claiming she has no drama talent and won’t succeed without the witchcraft! Of course Pandora is determined to prove her aunt wrong – but can she resist the temptation to use magic to make her path smoother? “Alice in a Strange Land” enters prime H Rider Haggard territory – she finds that her rescuer is a Victorian explorer – complete with mutton-chop whiskers – who has been kept young by the spring of eternal youth. Sir Edward takes Alice to see the Incan carving that tells the tale of how the spring was blocked by an earlier earthquake – it must periodically be stopped and started by earth tremors. It is this that the High Priestess wants to prevent, by sacrificing Alice or her cousin to the Incan sun god! Laika has found a hidden safe that is almost certainly where scheming blackmailer Gladvis keeps the negatives of the compromising photos she has taken over the years. (Ah, negatives – a blast from the past, in this science fiction story!) Gladvis inadvertently gives away the combination when she tips out a bunch of stuff from her drawer, for Laika to tidy up. Laika wastes no time in getting rid of the material in the safe, but Gladvis’ revenge is not long in coming. Laika’s dad gets the news that he has been downgraded to a Grade C manager – and the family have to move to an underground apartment in the Industrial Zone! Gwenny Gulliver is getting used to having tiny guests – the last Lilliputians have come to stay with her. There are a few hitches – not least them setting fire to the doll’s house that they are living in! Laura’s posh mother is on stage in “The Four-Footed Friends” – she wants to beguile the audience into signing her petition against extending the council estate. But mongrel Riley and best friend Winston undo her efforts by putting up such a show of friendship that no one wants to sign the petition! Good for them. Jilly and Patti are busy clearing up the school – headmistress Purity Goodfellow has turned all the parents and schoolchildren into perfect zombies in the wake of the riot that the two girls incited. Patti and Jilly must try and destroy the perfection drug as soon as possible, before Miss Goodfellow tries to feed it to the whole country – she has enough of it stored up to do so! Alice follows the sound of Chana’s voice and discovers that they have both been betrayed – Chana has been exiled from the city and will thereby surely die, and Alice’s cousin Karen has got the golden urn and declared herself sun goddess. The temple priestesses seize Alice on sight and she is forced to dress as a jester in order to appease her cousin, who is finding that power has gone to her head! 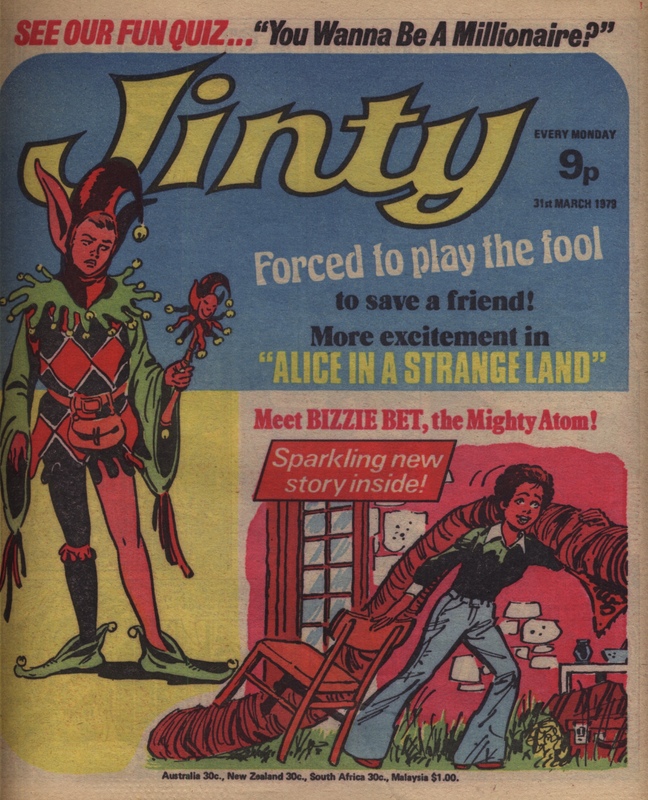 It is the first episode of “Bizzie Bet and the Easies“, a lightweight two page humour strip that has started running in the place of “Sue’s Fantastic Fun-Bag!”. Bet is an energetic girl but her friends the Easies are much keener on a quiet life with minimal effort. I like their style, personally! Laika is starting to grow her forbidden garden, but she has to balance the needs of tending to it with the danger of getting caught in the Forbidden Zone. This time the police nearly catch her, and her weak little sister Valli is half-dead with anxiety. Susie is no longer the prisoner of the bell – at least temporarily so, because her gran can’t get at her while she is on the residential gym course. A weight seems to have lifted from her, and Susie’s gym mojo returns – but the gran doesn’t give up as easily as that! Ann tries to emulate her sister by demanding that the bullies who have pinched a precious photo album give it back – but instead they just rip up the photos! Ann is heartbroken but more importantly she can’t face telling the news to the old lady whose photo album it is. When the story comes out, more and more people are disappointed in Ann and she feels once again that she can never make up for her dead sister. The “Daughter of Dreams” is Pauline Starr – she’s really just a figment of shy Sally Carter’s imagination, but such a strong imagination that she comes to life! Sally is the only person who can see her, but the fantastical creation can nevertheless have an effect on the world around her… and on Sally’s confidence, of course. The sequel to this story is drawn by the unknown artist who drew Merry, but this is done by the hand of a different artist (probably a Spanish person by the looks of the style). The four-footed friends are posh Peke Winston and scruffy mongrel Riley – their owners are also fast friends, but Laura’s mum is having none of it. Riley ends up shut in a shed, with a threat to turn him over to the police, as a vermin spreader. Patti is still a normal teenager in “Children of Edenford” but not so the girls next door – Mandy and Debbie used to be lazy messy little horrors who never helped out, but now they make posh suppers for dinner parties and listen to poetry records for fun. 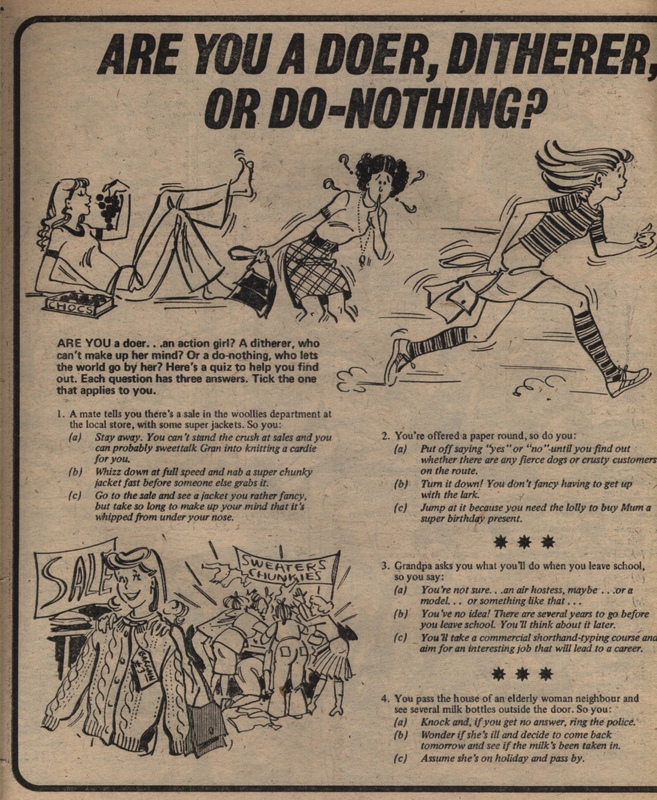 Patti escapes to visit her friend Jilly – only to find that Jilly too, is proposing to do some maths homework for a bit of fun, and has taken down all her Travolta posters! “Pop music is a waste of time. It neither enriches the soul nor challenges the intellect.” Yikes!